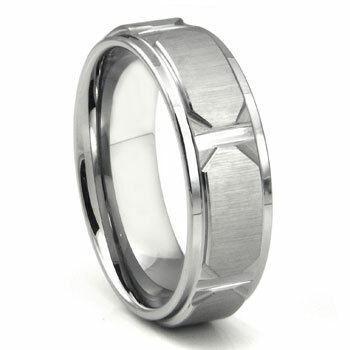 This masculine tungsten carbide ring features a raised center part consists of elongated octagon patterns. The pattern surfaces are made in satin finish and the rest of the ring is finished in high polish finish. The inside of this ring has a comfort fit design and the tungsten carbide is manufactured with nickel as binder and therefore it is hypoallergenic and safe for any one to wear. Rating: 4.7 / 5 , based on 7 reviews. The ring is just as nice as I hoped it would be. This is my second purchase from Titanium Kay. The first was for my wedding band 5 years ago, which was so nice I decided to come back here to replace it after losing it a few months ago. This is a different band from my first, only because... well just because. I liked the first purchase just as much and highly recommend this site. Their sizing and representation of the rings on line have been spot on. What you see is what you get. We were amazed at how quickly the ring arrived.Packaging was nice and the ring was beautiful. Thank you! I purchased this ring to propose to my boyfriend and when it arrived I just feel in love with it. I look forward to purchasing his actual wedding band through here. I couldn't be more satisfied with this ring. My only suggestion on this was the box it came in...looked a little cheap but what was inside was gorgeous. Bought this ring for my husband, and he loves it! The design is unique and masculine. Got it engraved and it was back to me within 3 days. Awesome, fast service. My wife and I were shopping for rings when we came across this one. She told me it looked like a king's crown and that it would be perfect for us. We did the two day express shipping and received it right on time. We got married two days later and it was an amazing feeling putting this ring on to symbolize our love. It's a gorgeous ring and very sturdy. I'm a truck driver and I don't have to worry about it scratching or bending. It's a perfect fit and still gorgeous as the day it arrived!